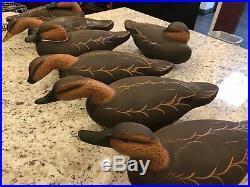 LOT OF 7 SIGNED DUCK DECOYS. 7 BLACK DUCKS SIGNED BY MICHEAL VEASEY. DUCK SIZES LISTED FROM LEFT TO RIGHT. #1: 15''L x 8''W x 7''H. #2: 20''L x 8''W x 5''H. #3: 18''L x 7''W x 7''H. #4: 19''L x 7''W x 5''H. #5: 20''L x 7W x 5''H. #6: 19L x 5''H x 7''H. #7 (TOP) 16''H x 7''W x 7H'. #1: 15''L x 8''W x 7''H #2: 20''L x 8''W x 5''H #3: 18''L x 7''W x 7''H #4: 19''L x 7''W x 5''H #5: 20''L x 7"W x 5''H #6: 19"L x 5''H x 7''H #7 (TOP) 16''H x 7''W x 7H'. 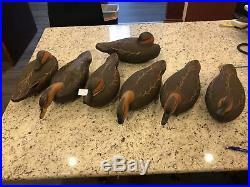 The item "LOT OF 7 MICHAEL VEASEY BLACK DUCK DECOYS" is in sale since Thursday, February 7, 2019. This item is in the category "Sporting Goods\Hunting\Vintage Hunting\Duck Decoys". 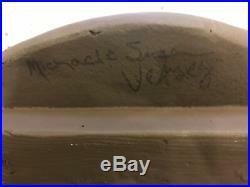 The seller is "joelrsny" and is located in Great Neck, New York. This item can be shipped to United States.